After living through his parent’s bitter divorce, Tristan surprises everyone when he decides to uproot his life and move across the country with his dad. Disenchanted, Tristan deals with his pain by shutting out the world… until one day, when trying to retrieve a lost baseball, he climbs a tower and meets a girl. Helena Thompson is like no one Tristan has ever encountered. She’s quirky, weird, and lives in an imaginary world—her only way of coping with the bizarre life her paranoid mother forces her to lead. Drawn by Helena’s magical view on life, Tristan finds himself returning often to the unique girl with the long golden hair. But spending time with her is not an easy task, especially because their relationship must be kept a secret. When Helena’s mother discovers the truth, can Tristan find the strength to fight for the girl who has awakened his heart? Or will the paranoid woman who keeps her daughter under lock and key stop their dreams from coming true? If you’re looking for a modern day fairytale that has a definite fairytale feel, but also deals with serious topics, this is the book for you. This book is very different from the books by Jordan Ford I’ve read before and there were parts I enjoyed very much, but also parts that left me feeling a bit meh. I think part of that is because I just read a very good book and another part is because I usually don’t enjoy fairytale retelling as much, it’s just not my genre. Having said that I do think the author did a great job with the retelling part, it has clear hints toward the original fairytale, Rapunzel, but at the same time not too much. It was still very much it’s own story as well. There were parts were they talk about fairytales and even mention Rapunzel and acknowledged their story is similar, which was a tad jarring to me. There’s also talk of poems and fairytales and stories and it could get very romantic at times. But it didn’t always work for me so well. There were also a same type of plot point that seemed to got repeated a few times and I think it only worked really well the last time. There were parts where I just felt like the story wasn’t quite right for me, but it’s a very beautiful and well written story. Even with the few issues I had I quickly read through this book and there are some very beautiful parts. I loved the ending, it’s harsh and painful at parts and also so very moving and beautiful in other parts. It’s real and realistic and has that romantic fairytale feel as well. 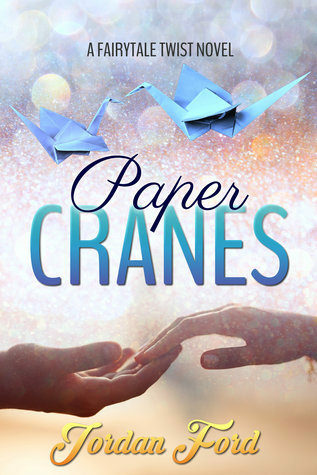 I also liked the paper cranes and the title and cover is so perfect for this book. The book is told from Tristan’s point of view only. I had kinda expected a dual pov, but this worked much better. Because while it’s their romance, it’s also very much Tristan’s journey. I liked Tristan for the most part, he felt like a realistic moody teenager and it was awesome to see him change and learn how to live when he met Helena. Helena I always envisioned as the actress who plays Luna in the Harry Potter movie for some reason, but it kinda fits. She’s quirky and a bit weird as Tristan would say, but she also has a kind heart. She seems wise beyond her years and naive at the same time. She’s all about stories, imagination, fairytales and romantic poems. And where Tristan feels jarringly real at times, she seemed more like a fantasy, like she wasn’t quite real. And then among the fairytale and happy themes, there are some serious topics spread throughout the pages as well. It deals with a mental disorder, how divorce can break apart a family and even some physical disability. I just felt at times a few of those themes could’ve been explored a bit more, but at the same time it was nice the tone mostly stayed light while still touching upon those topics. It was well done. There’s also a teacher who takes an interest in helping Tristan, who seemed so nice I was wondering if there really exist people like that. My favorite character was probably the girl Mika (I forgot her full name), I just wish we got to see more of her, but the parts we saw I liked. She seemed so nice and persistent even when Tristan was brushing her off. And there are these scenes were Tristan helps are that were great. To summarize: this book is a modern day fairytale full with romance, finding your way and some heavier themes as well. It has a clear fairytale feel. It does the retelling part well, it is clearly a retelling, but also very much it’s own story. At times I had some trouble really getting into this book. It’s a great book, just not quite right for me somehow? I loved the ending though, it was perfect for these two, although if things had played out differently it would’ve worked to. It was interesting how some more serious issues got woven throughout the story as well, although I did feel they could’ve been explored a bit more at times, but at the same time I liked how the story kept it’s light feel while touching upon those topics. The book is told from Tristan’s point of view only, which worked great here. Helena was an itnerestign character, although at times she didn’t feel quite real, more like a fantasy princess with her fancy of way of talking and how she seemed so wise for her age and so naive at other times. It really is a great romance and a beautiful story, even though I felt like it didn’t quite hit all the right notes for me. I like fairytale retellings and my favorite had always been Beauty and the Beast. This sounds good, thanks for the review. This was a good one. Mulan and The Little Mermaid always used to be my favorite fairytales :). Good that it hit a good balance between being original and capturing elements from Rapunzel. I like that there are some deeper parts to it beyond just the romance for Tristan. I don’t think I’ve heard of this author before so glad to get your review. I am really happy how well it made that balance between being original and having the elements from the Rapunzel story. It also had a nice balance between the more lighter parts and the deeper parts. I’ve read one other series by this author and really enjoyed that one, so I was happy to get the chance to read this one too. I am looking forward to her next series. oh I just love a good fairy tale retelling, and I never mind a bit darker themes as long as there is a happy ending. Yes there is a happy ending. It’s a really good fairy tale retelling and more serious themes worked really well here. A contemp Rapunzel retelling, interesting. But it does sound like it’s very much its own story. Tristan sounds like a great, realistic character. Just from the blurb though I can see why you got a Luna vibe from the girl. And it sounds like this book covered a lot of serious topics, it’s interesting how some books can do that while still staying light. I liked that it was very much it’s own story, but still had some clear hints to the Rapunzel tale. Yeah the girl really gave off a Luna vibe to me, it did fit her though as she was basically a bit more romantic version of Luna. Tristan was a very real character and I enjoyed reading about him. It was nice how the book tone managed to stay light while still addressing some serious topis as well.